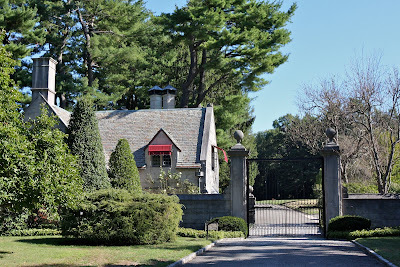 The front gate and gate lodge to 'Rynwood', the Sir Samuel Agar Salvage estate designed by Roger Bullard c. 1927 in Old Brookville. Today the estate functions as the international headquarters of Banfi Vintners. Click HERE for more on 'Rynwood'. Click HERE to see 'Rynwood' on google earth. 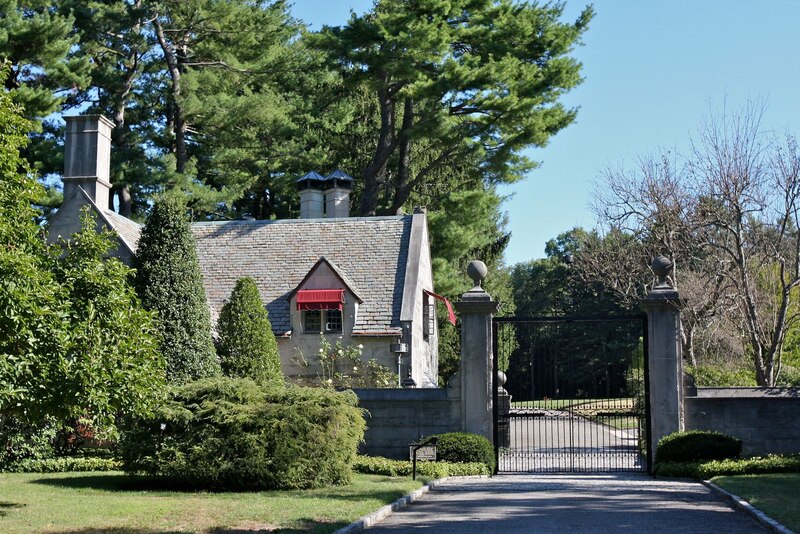 Were gatehouses typically built for security reasons or was it sometimes merely a part of "estate design"? That's a rather good question. There was definitely some aspect of security behind them but obviously if someone were determined to get onto the property it's not like that gate will stop them. Perhaps more for the appearance of security. Where is this derelict gatehouse you speak of...in NY? No, it was in New Jersey, of all places. "No, it was in New Jersey, of all places." Can it been seen at Google Earth? If so I'll mark it at wikimapia. I think back in the 60's there was just an old lady living up there at the end of this driveway, in which case a gate house comes in handy..it was quite grown over before the Banfi people came along. Lundy, now I remember..no old lady, just no one home all those years. I remember the painted green iron fencing with the fancy cartouche details.Its probably painted black ( as per the gate here)now, but it was green back then. As a child I always wanted to live in a North shore "gate house" when I grew up. I was fortunate enough to visit the house in '79, (I believe) when it was the site of a Designers' Showcase; the only great house I'd seen that could possibly hold a candle to Coe Hall. In those pre-Reagan days, it was lavishly done in the way only up-and-coming designers could, and quite lovely. Villa Banfi purchased it shortly after that (it was for sale at the time). Security word - inglyti: something kinda, sorta British. We used to have friends that lived in a two structure Norman affair on Brookville Road. One house right-driveway-one house left.I don't know the layout but, our joke, as kids, was that we used to see Mrs. Jennings crossing the drive way at odd times of night and early morning in her sheer-ish nightgown..and it was a very ghostly image indeed. Fencing under Lundy was actually robin's egg blue and the cartouches included elaborate letter "L"'s. Was highly unusual and enlightened (for a North Shore incorporated village) that Old Brookville allowed the estate to be saved via a commercial use.